5 buses carrying citizens from Sheikh Maqsoud to Afrin were kidnapped by islamist opposition fighters as tensions rise between Kurdish forces and islamist opposition factions including JAN.
SAA clash with opposition forces in al-Zaharaa neighborhood, western Aleppo. Reports of casualties on both sides. SDF continue their attacks against IS near the Euphrates River and begin to advance east towards Ain Issa. 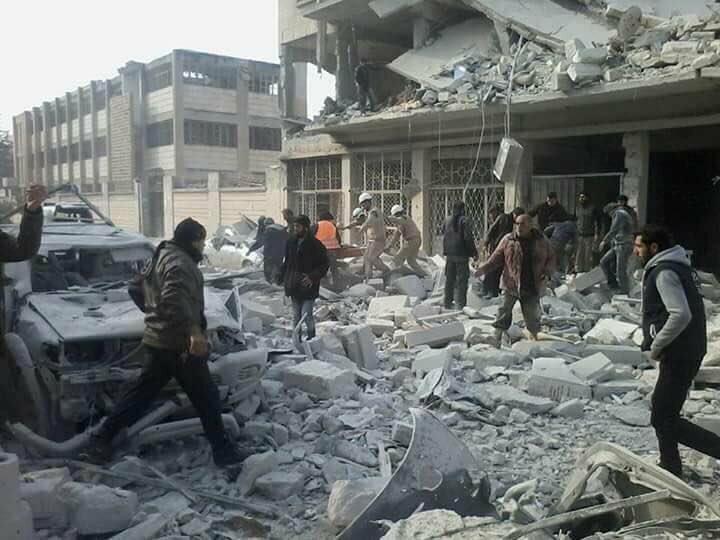 Aftermath of suicide attacks in al-Zahra neighborhood, Homs. Image courtesy of @arabthomness. 17 islamist opposition fighters were killed by an explosion of several mines set by the SAA inside an islamist opposition faction farm in Kufer Shamis, 55 km north of Daraa. 4 killed by SyAF airstrikes on Kiheel, 15 km east of Daraa. Clashes break out between SAA and opposition forces in the vicinity of Zimrin, a village 48 km north of Daraa. The agreement signed between SAA and opposition fighters from JAN, IS, and other factions in southern Damascus neighborhoods has been put on hold due to logistical issues related to securing the road between Damascus and Raqqah. The agreement entails the transfer of 3620 men and women, 2090 of them fighters, from south Damascus neighborhoods to northern Syria. 9 casualties and 17 wounded by opposition shelling of SAA-held al-Wafddien Camp. An SAA and Hezbollah ambush near Zabadani, western Damascus Governorate, caused the death of 5, 2 of which were confirmed as opposition fighters. 5 casualties in Duma after SyAF airstrikes and SAA shelling this afternoon. IS launch an attack against Abdal al-Sham islamist opposition faction in Wadi Barada. 2 of Abdal al-Sham’s fighters were killed. SAA clash with islamist opposition forces in Tall Kurdi, 18 km east of Damascus. Reports of SAA casualties. 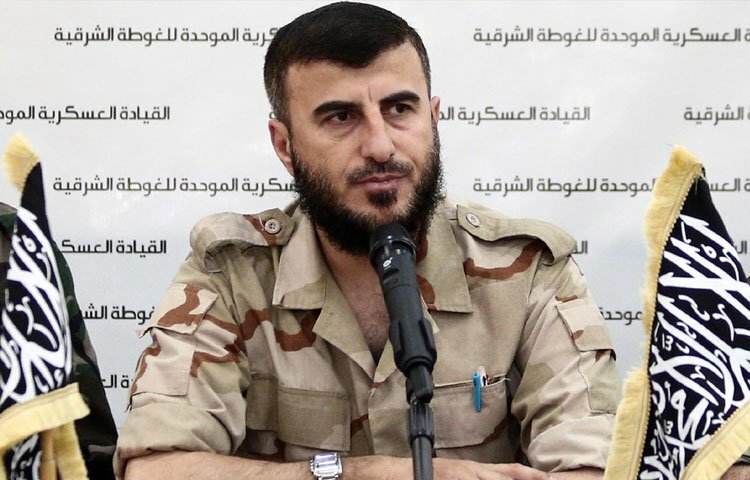 Zahran Alloush, commander of Jaysh al-Islam, killed by RuAF airstrikes on areas north of Marj as-Sultan. Image courtesy of @Ibra_Joudeh. RuAF airstrikes on areas north of Marj as-Sultan caused the death of Jaysh al-Islam leader, Zahran Alloush, along with 12 other fighters and commanders from Jaysh al-Islam and Ahrar ash-Sham. Jaysh al-Islam is considered the biggest opposition coalition fighting in the Damascus area. An agreement between the SAA and IS fighters in al-Kadam neighborhood, southern Damascus, allowed for a number of IS fighters to leave the area as trucks with humanitarian aid and supplies enter the neighborhood. The number of casualties caused by RuAF and SyAF airstrikes yesterday on Hamoryah and Irbin, both towns in the eastern Damascus countryside, has risen to 31. RuAF airstrike on Zahran Alloush location. Video courtesy of @MilitaryMediaSy. 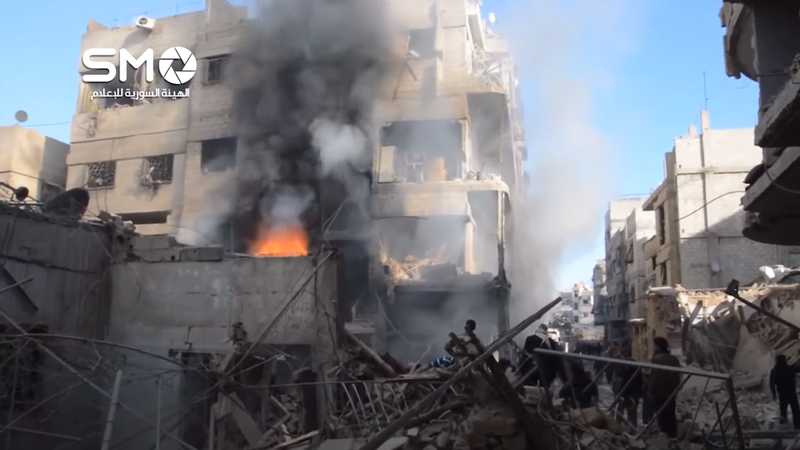 Aftermath of RuAF airstrike on Hamoryah. Image courtesy of الهيئة السورية للاعلام. Hamoryah, a village under opposition control 8.5km east of Damascus city center, was hit today by RuAF airstrikes that caused the death of 20 individuals. Clashes break out between IS and islamist opposition forces in areas between al-Yarmouk Camp and Yalda, southern Damascus. SyAF barrel bombs dropped on Darayya around 9 pm yesterday caused the death of 5 and injured more. The injured men and women from these barrel bombs suffered from symptoms related to sarin gas. SAA shelling of al-Nashabiyah, 19 km east of Damascus, caused the death of 4 individuals including one civil defense member. SyAF airstrikes on Hamidiyeh Quarter, central Deir ez-Zor, caused the death of 12 while IS shelling of SAA-controlled Harabesh Quarter, adjacent to the north of Deir ez-Zor Military Airport, caused the death of 11. SyAF airstrikes on the village of Bazyna, just west of Marj as-Sultan, caused the death of 19 individuals. The number of casualties is expected to rise due to the severity of the injuries caused. An SAA lieutenant-colonel was killed today near Sasa, 35 km southwest of Damascus. The lieutenant-colonel was apparently assassinated. The ceasefire between opposition and Kurdish forces in Sheikh Maqsoud neighborhood, northern Aleppo, came to an end as fighters from Ahrar Souriya Brigade released a statement that the Kurdish forces are their enemy and that Sheikh Maqsoud neighborhood will remain a military zone. Clashes broke out between the Kurdish and opposition forces in the neighborhood causing some casualties on both sides. SyAF airstrikes on IS– controlled al-Bab caused the death of 5. 3 casualties caused by opposition shelling of SAA-held Nile Street, northwest Aleppo. Aftermath of opposition shelling in Nile Street, Aleppo. Image courtesy of @edwardedark. Kurdish forces launch an attack against IS forces in Tishrin Dam, northeast Aleppo Governorate, apparently in an attempt to cut the road between northern Aleppo IS-controlled locations and the IS stronghold Raqqah. SAA, NDF, and al-Quds Brigades clash with opposition forces in ar-Rashedin District, western Aleppo. JAN and opposition forces clash with Kurdish forces in Bosoufane, 27 km northwest of Aleppo. Aftermath of RuAF airstrikes on downtown Idlib. Image courtesy of @SyriaCivilDef. RuAF airstrikes targeted areas in downtown Idlib causing the death of 17. 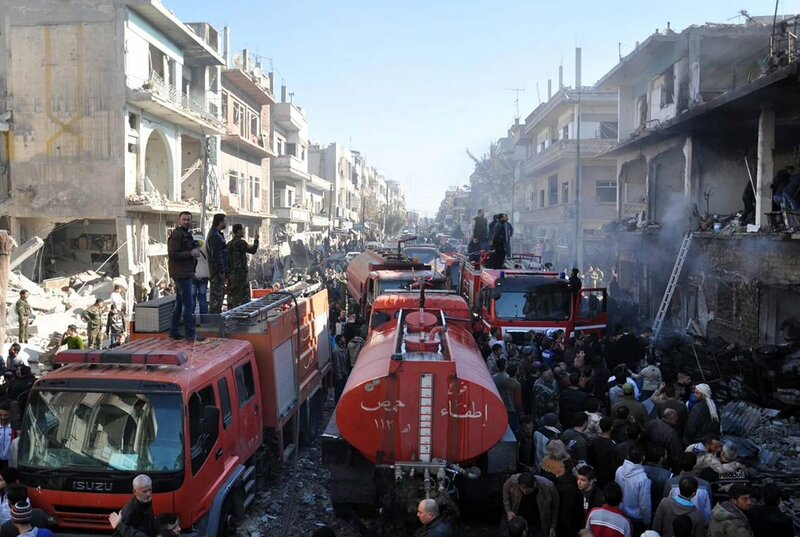 This is the first time the area was hit by airstrikes. The number of casualties is expected to rise due to the number of missing persons caused by these airstrikes. 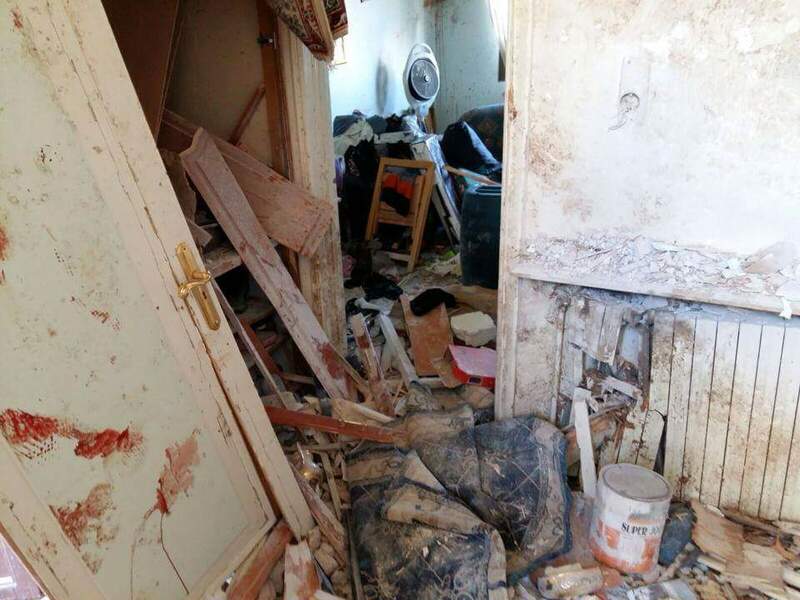 Opposition forces shell the villages of Kafarya and al-Fu’ah causing one casualty and injuring 5 others. These two villages are part of the ceasefire agreement signed between the SAA and opposition forces including Zabadani and a few other locations.